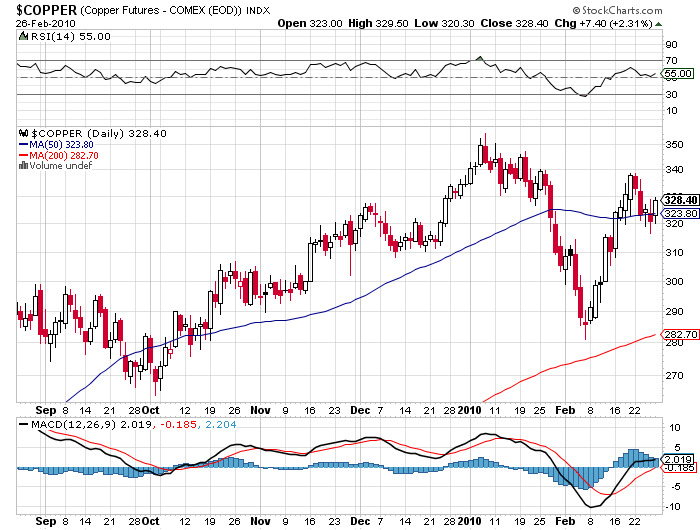 Readers of this letter are aware that I have been recommending liquidation of longs in copper futures and physical ingots from the $3.55/pound January high on down, along with major producer Freeport McMoRan (FCX). When trading resumes at the Shanghai open on Sunday afternoon US time, you can expect prices to open up huge. 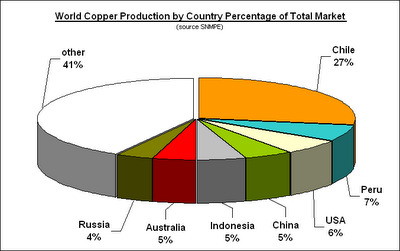 The 8.8 magnitude which decimated Chile on Saturday morning knocked out 27% of the world’s copper supply. Of the 19.7 million tons of the red metal produced globally in 2009, Chile accounted for 5.3 million tons. The earthquake was the fifth most powerful in history, and was the same magnitude that flattened San Francisco in 1906. While the epicentre is several hundred miles away from the main copper mining regions, Chile’s infrastructure has sustained major damage. There is no way to get the ore to smelters, or ingots to the market. Mines can’t operate without fuel or electric power. Roads, rail lines, bridges, and ports have been damaged. Banks can’t carry out trade finance without communications. If you haven’t unloaded your copper yet, this is an ideal chance to do so. 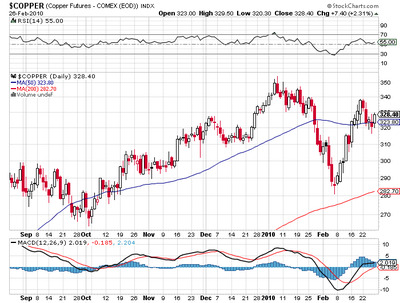 If the markets really get the bit between their teeth and make it as high as $4.00/pound there could even be a shorting opportunity in copper setting up. With the global economy coming off of last year’s sugar high, base metals are looking to go sideways at best in the near future, and possibly down. You can also expect Chile’s stock market to get slammed when it reopens, whenever that is. If we get a major sell off, it could create a great buying opportunity for one of the few countries in Latin America that is doing everything right. I’ll be doing more research on this in the near future.